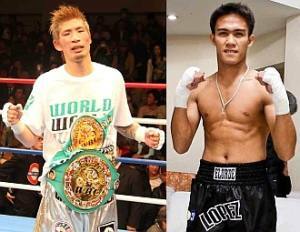 It's all systems go for the WBC super flyweight world title match in Yokohama, Japan today as defending champion Yota Sato of Japan and his Filipino challenger Sylvester Lopez made their respective weights according to Lopez's manager Gabriel "Bebot" Elorde who sent the information to Philboxing.com. During the official weight-in ceremony today, the world champion Yota Sato successfully weighed in at 52,100Kg (115 lbs) in his first trial. Then, minutes later Filipino Sylvester Lopez stepped on the official JBC scale but was 100 grams overweight. In the second trial 15 minutes later, the Pinoy failed again to make weight. One more chance was given forty five minutes later and Lopez did not blew it. Success. World title challenger Sylvester Lopez made the required 115 lbs (52,100 Kg) in his third try. Official weights for both 115 lbs (52,100 kgs). Sylvester Lopez, 24, the current Silver Flyweight Titlist, is in Japan in his first shot at a world title accompanied by his manager and promoter the knowledgeable Gabriel "Bebot" Elorde; while world champ Yota Sato, 28, is being guided by experience trainer Seiji Shinoda of the famed Hakata Kyoei Boxing Gym in Fukuoka Japan. The WBC officials are: referee Laurence Cole of Texas, USA. The three ringside judges are Dr. Louis Moret of Los Angeles, California; Omar Mintun of Tamaulipas, México and David Bilocerkowec of Alberta, Canada. Supervisor is Frank Quill of Melbourne, Australia. The fight for the prestigious WBC green & gold belt world title belt will be tomorrow at the Bungka Gym in Yokohama, Japan. Good luck to both warriors and the best man to win! The Yota-Lopez fight will be shown live in Japan. In the Philippines it will be aired on AKTV at 9pm Sunday.